Pocket tester for measuring pH levels within a range of 0.000 to 14.00. Pocket tester for measuring Dissolved Oxygen levels. Pocket tester for measuring pH, Total Dissolved Salts, Salinity, Conductivity and Temperature. Measures Sodium Chloride levels from 0 to 0,000 ppm, Total Dissolved Solids from 0 to 9,999 ppm and temperature from 32.0 to 149°F or 0.0 to 65°C. 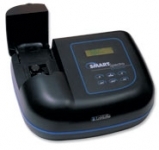 Waterproof tester, which measures Total Dissolved Solids in both 10 ppm increments up to 1,990 ppm. Waterproof tester which measures pH from 0 to 14 with an accuracy of ±0.1 pH. Compact, handheld, hi-tech meter for measuring Conductivity. Compact, handheld, hi-tech meter for measuring Total Dissolved Solids. Highly accurate, electronic meter designed to measure pH within a range of 0.000 to 14.00. Highly accurate, electronic meter designed to measure pH within a range of 0.000 to 14.00. Kit includes liquid buffers. Advanced, highly accurate, easy-to-use meter. Includes over 80 pre-programmed tests. Memory holds 25 user calibrations. Sequences can be customised for frequently run tests.